Today, I open Curried Favors and the first thing I note on the inside jacket is “Winner 1997 Julia Child First Book Award”. Julia again! The New York Times calls it “An artful and intimate cookbook.” It’s also an IACP cookbook awards winner. Well. I am happy to spend some more time with this book – it’s been a couple years since I adventured into its pages. And it is an adventure. Maya Kaimal’s words and photos take the reader on a journey to southern India and the flavorful curries and other dishes found in this area. 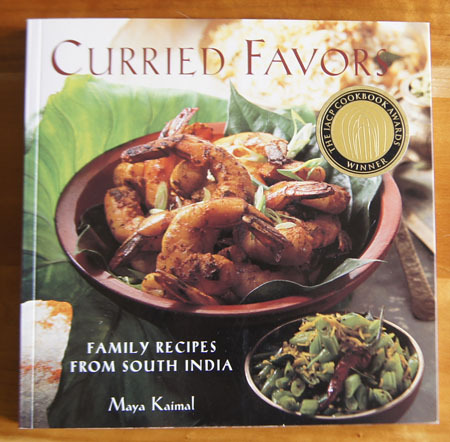 In Maya Kaimal’s home, dinners alternated between her American mother’s “forays” into Julia Child and her father’s “latest experiments” with Indian cooking. 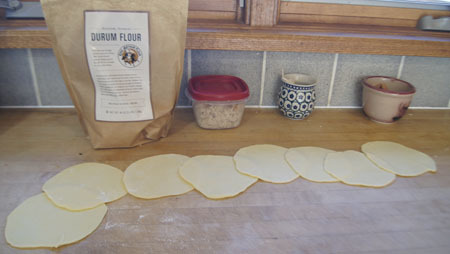 At one point, her father was approached by “the owner of a cookware store in Boulder, Colorado, to see if he’d teach a course on Indian cooking”. (My guess is that that store was the Peppercorn.) He accepted, and taught the “popular class” for four years. “Kerala [a state Southern India] is an interesting and unique culinary pocket, its cuisine shaped by climate, geography, and religion.” Coconuts, fish, shellfish, curry leaves, mustard seeds, and rice are abundant. Its location on the old trade routes brought new spices and foods to the ports and to the cuisine. Kerala is predominantly HIndu, but also has large Christian and Muslim populations. Christians eat all types of meat, some Hindus are vegetarian and some eat chicken, fish and lamb, but not beef; Muslims don’t eat pork. Each cultural group brings unique culinary contributions to the cuisine of this area. My hubby hates curries. So when I cook from this book, I have to say “we are having a stir fry tonight”, and keep the “C” word out of it. He also cringes at anything colored turmeric or saffron yellow. He simply has an aversion to Indian foods. And yellow main dishes. But I consider the recipes I have tried from this book explosive in flavor, hot and spicy and bright. Kaimal tells us that “curry powder” is not a simple spice, and “curry” does not define a particular dish. Instead, a curry is a dish of meat, fish, eggs, and/or vegetables cooked with a mixture of aromatic spices. Packaged “curry powder” is not called for in any of the recipes in this book. As usual, I searched “Maya Kaimal” on the internet. She wrote one book after “Curried Flavors”. In 2003, she and her husband started a business, Maya Kaimal, selling Indian sauces, spices, and chips. Check out the website, because a lot of her recipes on posted on it. The best way to show the gist, spiciness, and simplicity of the recipes in this book is to cook an example. 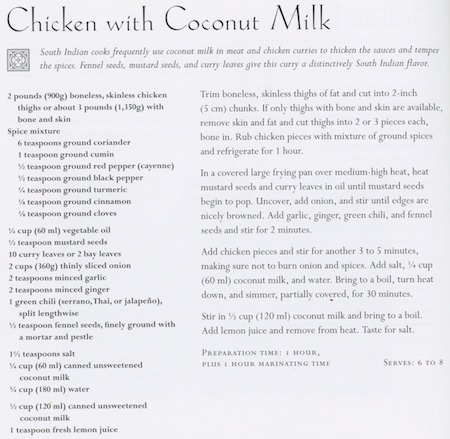 I choose one that I have tried before, Chicken with Coconut Milk. I plan to cut the recipe in half and leave out the turmeric, and use less cayenne. 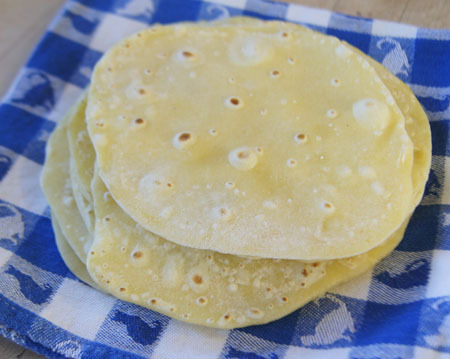 I have everything for this recipe in my pantry and or my freezer except the coconut milk and a fresh hot chili (a quick trip to a store solved those issues). I will use bay leaves instead of curry (or kari) leaves. 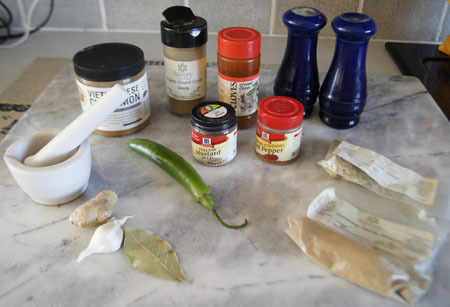 (I know where to find curry leaves in downtown Boulder, but don’t have any in my pantry right now.} I also increased the amount of coconut milk. Below is my adaptation of the above recipe. Combine the spices and rub into the chicken. Let stand 1 hour. When the chicken has rested in its rub (refrigerated) for at least an hour, set a frying pan on medium high heat and add the oil, mustard seeds, and bay leaf. Cover. Heat until the mustard seeds pop. Uncover and add the onion and cook and stir until the onion is browning nicely. Add the garlic, ginger, green chili, and ground fennel seeds and cook and stir for 2 minutes. 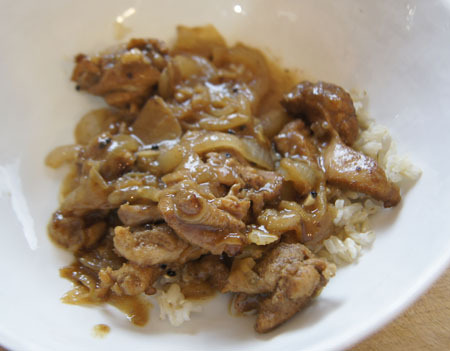 I served our curry over brown rice. I love this curry. I like the whole cooking process, too. The aromas as it cooks! The flavors as I eat it! But hubby? Well, he ate it all. But when asked, he said something like “yeah, it was dinner”. Guess I didn’t slip this curry by him. Maybe it isn’t just the yellow color that he does not like about curries. His loss. Taste? Not a lot, but I thought they were interesting. They sure are cute.